If you dream of climbing the Seven Summits, your starting point will most probably be Mount Kilimanjaro in Tanzania or Mount Aconcagua in Argentina as they are both accessible by anyone with a good level of physical fitness and the routes are not technically challenging… but that is where the similarities end. At 6,962 metres above sea level, Mount Aconcagua is over 1,000 metres higher than Mount Kilimanjaro at 5,895 metres, so the expedition is longer, you need more clothing / equipment for high altitude and you need to prepare yourself both mentally and physically for over two weeks on the mountain in temperatures that fall way below zero at night. Mount Kilimanjaro climbs range anywhere between 6 and 11 days depending on the route you chose. The most popular climb is widely considered the 9-Day Machame Route due its high success rate, which includes six nights on the mountain and two nights in a hotel, one before the climb one after. If you decide to climb Mount Aconcagua, you can choose between the ‘Normal Route’ and the more technically challenging ‘Polish Glacier Route’. Both routes are 18-Day Expeditions that include two nights in Mendoza, one night before your climb and one night after, one night in Penitentes prior to your ascent, and two extra days for contingencies such as bad weather on the mountain. 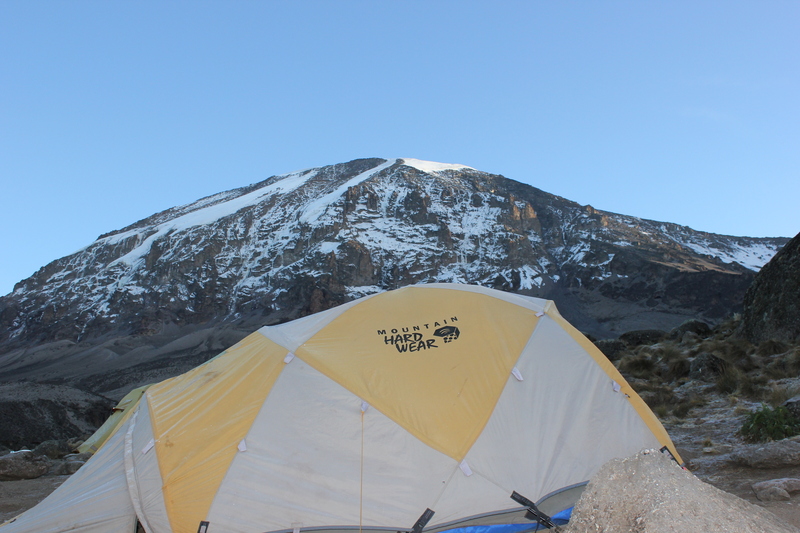 Whichever route you choose, you will spend at least 12-nights camping on the mountain, which is draining both physically and mentally, and twice as long as you would spend of Kili. If you have climbed Kilimanjaro, you will know just how amazing the Mountain Crew are! They carry everything except for your small backpack with your daily essentials, and so the only thing you have to worry about getting to the top of the mountain is yourself! When you arrive in base camp, your tents are set up ready for you and the chef is busy preparing your evening meal, so you are free to freshen up at leisure, have a rest, or chat with other climbers until dinner is served. Aconcagua is a little bit different… You luggage is transported by mules to Plaza de Mulas at 4,260 metres, but from here on, you have to carry it yourself or hire a personal porter to carry it for you. Of course, you will leave any unnecessary equipment at Plaza de Mulas, but carrying a load will certainly make a difference when you climb. You are responsible for putting up your own tent on Aconcagua, and while the guides will assist, it is ultimately your responsibility to set up camp and make things comfortable. Again, this is no big deal, but it is definitely something to bear in mind, especially after the ‘luxury’ of Kilimanjaro! Whichever mountain you decide to climb first, we hope you passage to the Roof of Africa or Roof of South America is a safe one… Who knows, we might see you there!